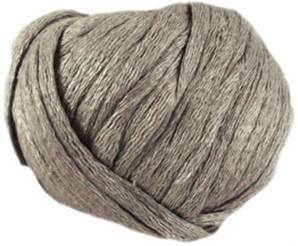 Katia Sole 53 scarf knitting yarn in a mid grey shade is cotton rich fine mesh scarf yarn with a subtle sparkle which creates lavish airy ruffles. 66% cotton, 34% nylon, 16m per ball and 2 balls make a scarf. General instructions: always knit along the top edge of the ribbon: for each stitch, insert the needle in the stitch first and then unfold the ribbon. To join in a new ball, overlap the 2 ends of the tape and sew along the 3 sides of the join using a double strand of thread in a similar shade. Cast on 6 sts and work in garter st leaving approximately 1in (2.5cm) between each st. When you run out of yarn, cast off.